SHARPs PN-40TC1 is the first of the industry-leading BIG PAD interactive display models to serve the exciting new Huddle meeting space requirements for 2-6 people. Having a responsive PCAP touch, easy-to-use approach, and fast setup time is central to the PN-40TC1 Huddle concept. The Mini OPS option slot allows for a clean and tidy integration of an optional wireless module, which allows prompt and easy BYOD collaboration with mobile devices. For the rapidly evolving office environment. 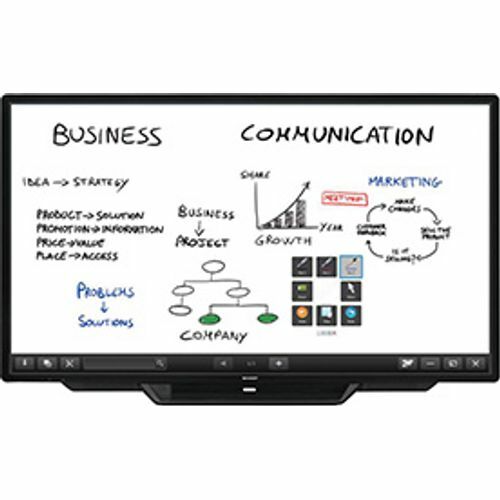 Sharps surprisingly different 40 BIG PAD is equipped with a particularly fast, responsive and intuitive PCAP Capacitive 10-point multi-touch, which offers optimised performance for huddle meeting rooms, as well as interactive retail touch applications. Sharps suite of application software, including PEN software for enhanced team communication and the capturing of all creative expression, means that industry-leading decisive and productive collaboration is achieved. With the importance of video conferencing and video-collaboration, users can easily mount a web camera to the conveniently positioned attachment holes on top. Similarly, quick setup and versatile placement is assisted with the bundled desktop stand (landscape orientation). The bundled SHARP Touch Viewing Software offers an easy-to-use interface and file system to collect and organise data from different collaborative projects. Perfect for huddle meetings handling multiple data files. The BIG PAD PN-40TC1 is Sharps fresh approach to boosting dynamic business meetings.